The little girl is approaching the cage. 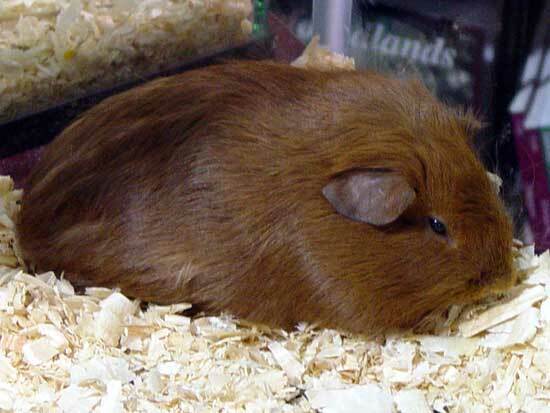 Twix, the guinea pig, saw her coming and now is cowering and shaking in the far back corner of his cage. His mom, Hershey, is in the cage too and has put herself between Twix and the door of the cage. She wants to protect him. Kaitlin is a little girl who has an older brother named Wynter and a sister Maggie. Kaitlin is spoiled and always gets her way. She is also mean. She doesn't care who she hurts as long as she gets her way. When it comes to her pets, like Twix and Hershey, she doesn't seem to care at all that she hurts them. She shakes the cage and bangs things on it, scaring them. Kaitlin hurts Twix every time she holds him. She grabs him by his paws and pulls him. His little arms are not strong enough to hold him, but she often carries him that way. She has dropped him. Under his fur are bruises from her mistreating him. 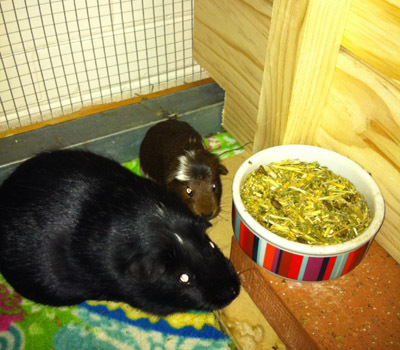 Maggie is the oldest of the three siblings and tries to intercept Kaitlin from picking up the guinea pigs. This time, though, she wasn't home to stop her. When Kaitlin got to the cage she started shaking it. Then she picked up one end and dropped it with a bang. Both guinea pigs are now huddled together in the corner where they slid. Twix is afraid. His eyes are squeezed shut and his head is buried in his mom’s fur. He is quivering with fright. Kaitlin opened the door and reached in her arm to grab Twix's mom, Hershey. Twix screamed in his guinea pig voice. He shuddered as his mom was taken out of the cage. 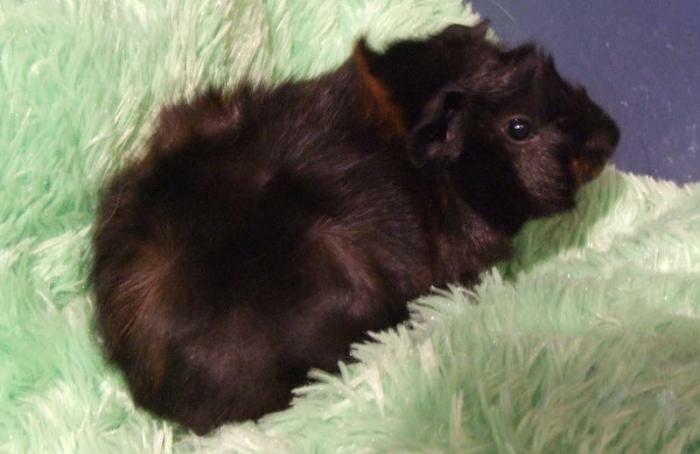 Hershey was relieved that she was picked up by the girl instead of her son, Twix. Wynter knew that if he tried to stop her, she would just cry and their nanny would come and give Kaitlin her way. He had learned that Kaitlin was the nanny’s favorite. So, he followed her outside. 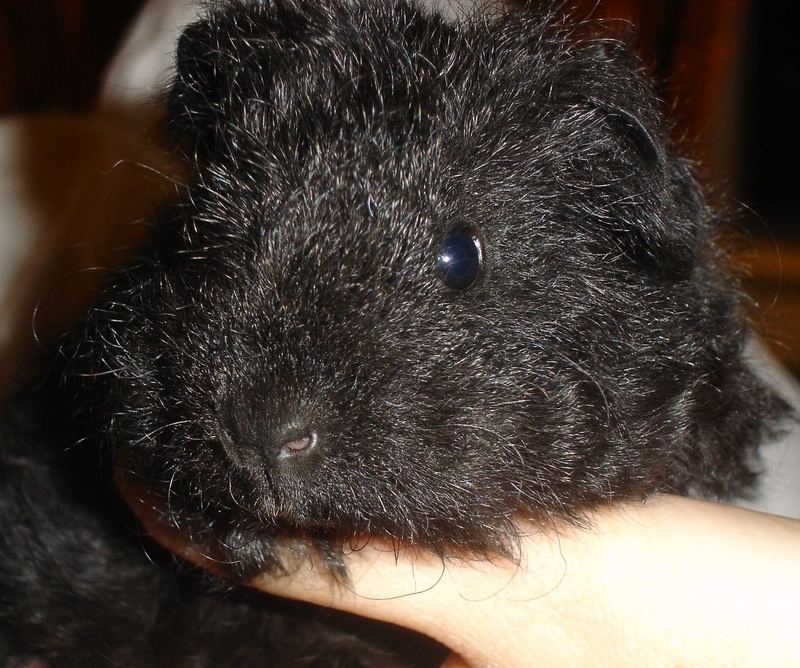 He didn’t know what he would do, but he wanted to save the guinea pig. What she did made him cry. She threw Hershey before Wynter could react. He ran to where the guinea pig had landed and was relieved she had landed on a cushion that had fallen off the lawn chair. The guinea pig appeared to be alright, but he didn’t want Kaitlin to know. He turned back toward Kaitlin and watched her as she stomped back into the house. Wynter carefully picked up Hershey and carried her around to the front door and took her into his room and put her in a box. He kept the lid off it so she could breathe. The box had tall sides which would prevent her from climbing out. Next, he took off down the stairs to see what Kaitlin was doing and ran into his sister Maggie. He almost knocked her down. He shot out his arms to steady her and quickly told her what happened. They both ran to the cage. It was empty! Kaitlin was nowhere to be seen either! They ran outside. There she was, sitting on the grass with Twix. Twix was not moving! They carefully approached. Maggie asked her if she would like some ice cream. She jumped up and in her haste almost stepped on Twix. She said, “I’ll get it!” Off she ran to the kitchen. Wynter reached down to Twix but hesitated, almost too afraid to touch him. Twix was alright, just quivering! Wynter could feel him shaking as he carefully picked him up. “What are we going to do?” asked Wynter. Maggie shrugged and stood there thinking, then said, “Take Twix up to your room and put him with his mom. I’ll think of something.” Wynter quickly but quietly walked around the house again and up to his room. “What do I have, that you want?” inquired Kaitlin. “Well, I know you have always wanted my stamps and I would like a guinea pig. I will trade you my stamp collection for Twix.” explained Maggie. Maggie said, “Come to my room, and I’ll give them to you.” They went to Maggie’s room and got the stamps. Kaitlin took the stamps to her room and Maggie raced to get the cage. Wynter helped her carry the cage and the two guinea pigs to her friend Jacquelyn’s house. Jacquelyn was a very good friend and would help her. Jacquelyn understood perfectly and said she would love to keep Hersey and Twix. She said she had been looking to get a guinea pig. so why not have two. Twix had been afraid most of his young life. It took a while for him to understand that Jacquelyn was kind and would never hurt him. He finally had a home where he was loved and well cared for. Soon, the little girl that had hurt him was just a memory. He grew fat and happy in his new home. Hershey and Twix are happy to have a nice girl like Jacquelyn to care for them. Boys and girls, what are you thinking about this story? How do you feel about Hershey and Twix? Do you feel sorry for them and happy they have a new home? What do you think about Maggie and Wynter? Do you think they did a wonderful thing by protecting the guinea pigs? Maggie gave away something very precious to her. She gave away her special stamp collection so she could get two sweet innocent animals away from Kaitlin. Wynter and Maggie showed compassion to the animals in their care. Most importantly how do you feel about Kaitlin? Do you feel she was nice or mean? Do you think she should be punished for her actions? She didn’t treat God’s creation kindly. She didn’t love the animals in her care. God made guinea pigs, and we need to be kind to them just like all animals. If someone is not kind to animals, they will probably start being mean to people too. Proverbs 20:11 says, Even a child is known by his deeds, whether what he does is pure and right. We should want to be known as someone who is kind and loving to people and animals. Do you take care of your pets? Do you say nice, kind things to them? Do you make sure their needs are met? Do they like to be near you, or do they cower in fear? The Bible says to take care of our animals and pets. Proverbs 12:10a A righteous man regards the life of his animal… 27:23 Be diligent to know the state of your flocks and attend to your herds. Please take time and give me your thoughts in the comment box at the bottom. Ask your parents first. Type in your thoughts and then click on the “comment as” button and pick from the choices on the pull down. Then, click “publish”. Thanks! Memorize: Proverbs 20:11 Even a child is known by his deeds, whether what he does is pure and right. I think that Kaitlyn should be punished for her actions. Wynter and Maggie did the right thing. Thank you for the story I loved it. I read it to my sister. Thank you Christy! I think she should be punished also. I'm glad you loved the story. You must be a good reader to read it to your sister! I hope you enjoy the other stories as well.